WTHS won national awards in four categories during the 73rd annual conference of the International Broadcasting System Inc., held in New York City on Friday-Sunday, March 1-3. Attending from Hope and accepting the awards on the station’s behalf were junior Carolyn Wermuth of Milwaukee, Wis., promotion director; and sophomore Tom Zahari of Livonia, co-news director. 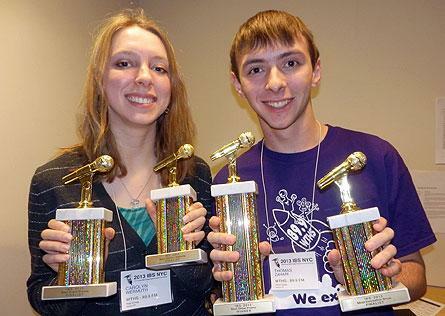 WTHS, the student-run FM radio station at Hope College, won four national awards during the 73rd annual conference of the International Broadcasting System Inc. (IBS), held in New York City on Friday-Sunday, March 1-3. WTHS won first place among all college and university radio stations in the country for “Best Show Promo,” for the segment “Freeze Frame” by junior Will DeBoer of West Lafayette, Ind., who is the station’s production director. Founded in 1940, the IBS is a not-for-profit education corporation that serves not-for-profit education-affiliated high school radio and college radio stations and streaming/webcasters, and has more than 1,000 member stations. The annual IBS Conference features more than 150 speakers and more than 1,000 attendees from all over the world. The conference featured finalist and winner awards in more than three dozen categories. WTHS, which began in the 1950s as a “carrier current” station and spent more than 25 years on AM, has broadcast at 89.9 FM since 1985. The station features alternative college music, also highlighting activities on campus, local news, sports and current events. Its studio is in the college’s Martha Miller Center for Global Communication. Dr. Vivianne Ruellot, associate professor of French at Western Michigan University, will present “See What You Say: Learning Pronunciation Using Computer-Mediated Visual Feedback” on Wednesday, March 13, at 4 p.m. at Hope College in the Fried-Hemenway Auditorium of the Martha Miller Center for Global Communication. Wide ranges of musical styles and instruments were brought to DeVos Performance Hall in Grand Rapids for the 25th annual Musical Showcase concert on Monday, March 4.